Time for another top ten and obligatory stab at summarizing the zeitgeist for another year. ... Or maybe not. I can’t play the zeitgeist game at will. Some years I notice an interesting trend; other years I don’t. Is it significant that I kept seeing positive references to Scottish culture (in Skyfall, Brave, Salmon Fishing in the Yemen) and gratuitous Scottish accents (in Coriolanus, Sister), or is it just that Scotland was on my mind? Did I catch a trend at Toronto when I noticed many films dealt with children and parents, or has that always been fertile ground for drama? In 2012 I think I had more luck looking in than looking out. I can’t define any trends in movie culture, but I can think of four epiphanies I had at the movies this year. Two of them have to do with specific directors. Wes Anderson and Quentin Tarantino have moved from the “overrated” lobe in my brain to the “genuine auteur” lobe. Anderson’s Moonrise Kingdom has all the forced quirkiness that defines his entire canon, but somehow, I was able to stop fighting the instinctive critique of his style and let it wash over me. I was able to appreciate, perhaps for the first time, how much effort and intent goes into creating something as colorful, nostalgic, and deliberately nonrealistic as a Wes Anderson film. Moonrise Kingdom fits perfectly into an entire body of work that deserves to be evaluated as a whole. I will have to rethink my mixed reaction to his earlier films. As for Quentin Tarantino, I was as viscerally put off as ever by his sense of gleeful, bloody revenge and moral certainty in amoral situations. 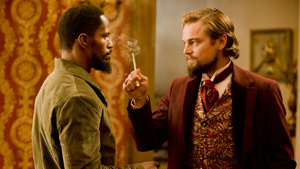 But with Django Unchained I was able to see how skillfully he is manipulating those instincts. The bloody shootouts really are supposed to be “fun,” and they really are supposed to make you question your own emotional reaction. Tarantino also won me over with his off-screen comments, first about film not being the same as video (he calls the new digital filmmaking “TV in public”), and with the revelation that all of his movies in the same alternate universe — the one in which the Civil War started a year early and the one in which Hitler was killed in a movie theater. My third epiphany came from reading several essays on the Observations on Film Art blog by David Bordwell and Kristin Thompson. The most obvious lesson came from “How to watch an art movie, reel 1,” although other essays such as “TINKER TAILOR: A guide for the perplexed” proved to be just as useful. You’d think someone like me would have learned how to watch movies by now, but Bordwell and Thompson so carefully and clearly explain “watching movies” that I think anyone could learn a trick or two from them. They say that a good art film will teach you how to watch it. If something in a scene is hidden or perplexing, then that is probably by design, and the movie will clue you in later. Each art film is like a game that teaches you its rules with each passing shot. There are movies this year that I watched very carefully that amazed me with how lean and dense they were. Films like Alps, Elena, Sister, and Our Little Differences, didn’t waste a single shot. My fourth epiphany crystallized as I was reading my friend Walter Chaw’s very personal take on Miracle Mile and how it fit into his life. He said that his life needed the arc of a story, just like his body needed food and his lungs needed air. At about the same time I saw Sarah Polley’s family documentary called, appropriately, The Stories We Tell, which opens with a quote which I paraphrase: “stories aren’t stories when they’re happening, they become stories afterward, emerging from the blur.” The human brain is remarkable, but it is not a computer; I think our minds really do need stories to make sense of the world. It’s irrational, but that’s why we are not Star Trek Vulcans. Even in my other life (in which I play a computer programmer) I learned that the best way to win free publicity for your app is to frame your offering as... a story. Perhaps my personal story will explain why my top ten list looks like it does. Life of Pi: I didn’t see a preview screening, which means it had already earned a lot of buzz by the time I saw it. I expected to leave feeling the film was overrated. But the film’s spectacle was grounded by the introspection of the humble storyteller, which made Life of Pi feel universal and timeless. I Wish: I saw it in Toronto last year, but it’s on some lists for 2012, so I include it here. It’s a charming and well-told story of two Japanese brothers, about 8 and 9. The movie is innocently told from their point of view. Our Little Differences: Two parents (one a surgeon, the other his housekeeper) send their teenaged children out for a night on the town, and have very different reactions when the kids don’t come home. This film is the opposite of “larger than life.” It’s so simple, so human, so well observed that it would be easy to miss. Stories We Tell: Sarah Polley crafts an impeccable story from the chaotic blur of her family’s skeletons in the closet. Pieta: Kim Ki-Duk returns to filmmaking as South Korea’s less showy answer to Quentin Tarantino. Pieta is disturbing and violent and it encompasses a tale of revenge. Yet the overwhelming emotional timbre is deep sadness. Alps: The director of Dogtooth offers another helping of Greek neuroticism. In the world of Alps (as in Holy Motors and to an extent in The Imposter), actors fill the roles of departed loved ones.